It started with a man in Maine who loved to make his friends comfortable. So one day in 1976, he went down to his workshop and hand-stitched something special. Something that was part slipper, part sock, and all comfort. Just like that, the iconic Acorn slipper sock was born. Since then, we've made a lot more footwear for a lot more people, in all kinds of styles, for all sorts of uses. But no matter what we create, the reason why we create it will never change–we still do it to make our friends comfortable. Comfort is at the heart of what we do, and always has been. We want you to find long-lasting comfort in every stitch, every pattern, and every detail. Because at Acorn, this is our promise–for everything we make to feel wonderfully, totally, perfectly, comfortably you. I bought one pair in navy and liked them so much, bought them in a different color. Really disappointing for the price. The cotton knit upper stretched out immediately, so now they are at least a size too big and won't stay on my feet. I've washed them to try and get them to come back to size, but it has not really worked. Additionally, the fabric lining got pilled very quickly, which means the footbed is now uncomfortably textured. The foam sole collapsed quickly, as well, so the cushion is gone. All around bummer. I didn't even try it on. I felt the back seam on the slipper and it was hard and sharp. Not going on my feet. It may be fine if I were to wear socks with them. I normally don't. Quite disappointed. There is something hard in the center of the back across the heel. There is no way I would be able to wear these without pain. This hard spot would be rubbing against my heel. Unfortunately these kept moving off to the side of my feet. Very easy return. Thanks, Zappos. One note about size: I wear an 8 and thus would wear a large, according to sizing instructions. The slippers were at least 3 inches too long. They looked like clown shoes. I strongly suggest you order down a size unless you are at the upper end of a size range...unless, of course, you are planning on attending clown school :-). I was looking for a supportive summer slipper. These are supportive but once you have worn them and stretched out the part that holds your foot to the bottom your feet will slip to the side of the slipper making it very easy to sprain your ankle. I wore the first pair out! Great color too. Very comfy slippers! I love them! 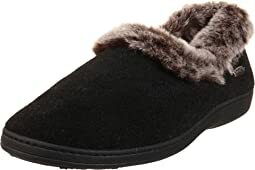 The most comfortable slippers I have ever worn and at a very attractive price. Followed a customers advice and ordered one size smaller as they will stretch in time. Very highly recommended for wear in the house or on the patio. I ordered these in XL for my husband who usually wears a size 12. They fit well and he loves them - comfortable and lightweight - with or without socks. It seems a plus that they can be washed. We always feel confident ordering from Zappos - easy, quick, guaranteed! I normally wear a 7, but sometimes a 6.5 in sandals or heels. The small was too small. The inner stitching rubbed my toes. So I tried the medium, but it was too big. I had to return. Disappointed because it really is a cute slipper. I am a size 6 and ordered a 5/6 and they were too big...had to return them. 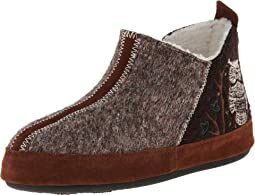 These are nice slippers, probably my 10th pair of Acorns over the years. However, the quality has degraded over the years -- the soul has something crinkly and stiff about it, and they're just not as cozy as they used to be. These are fine, but I will test out another brand next time. I have been wearing the same two identical pairs of slippers (not Acorn - some generic brand) for twenty years and they finally wore out. Those were the first slippers that ever felt comfortable and I hated to admit that I needed to replace them. I read the other reviews and was particularly concerned about the stitching in the heel bed. That has not been a problem. These are quite comfortable and molded to my feet very quickly. I'll probably buy another pair and be set for another twenty years. The small was to big. With different shoes I wear between a 7 and 8. They fit loose. Quality looked good. Too bad. Had to send em back. Too bad I had to order a man's slipper for my bunion, but my strategy worked. I like the gray color and they are soft and comfy! This is the second pair of these I've bought for my husband. He wears a 10.5 and I got him the large. 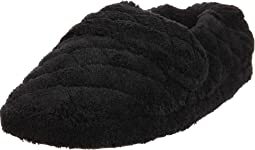 He loves these because they have the comfort of a slipper but they aren't enclosed so his feet do not sweat. I love that you can throw them in the washer! Because the size is a range it's a bit hard to find something that will fit both with and without socks - the size I got fits well with socks, but is loose without - maybe if I had gotten the collared style it might have fit better? Either way I feel like I got what I was looking for. They are soft, warm, memory foam feels comfortable. Overall I am pleased. Smart looking slipper. Cozy and comfy. But the small was much to loose on my 5.5 sized foot. Disappointed they had to go back. I wear an 8.5 and ordered the 8-9 Large. I wanted to love them, but I have a high instep and they were very difficult to get on. I like being able to step into my slippers without using two hands to tug them on. The length was about right, though, so I think an XL would have swallowed me. Wish there was a size 9. Those with high insteps might have trouble with these otherwise beautiful slippers. Very comfy and not too bad looking. These are really comfortable and I’m keeping them because I have a wide foot and slippers that fit are very hard to find. However, they are UGLY! 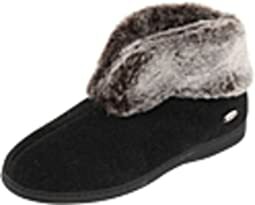 Nice slipper which I got to replace my old wool slippers that were my favorites. They’re as expected and fit a bit better with a sock so barefoot they are a bit clumsy. Super cute though! I’d order a half siz down if you want to wear them without socks.